Welcome to our wreath shop! Our wreaths have been featured in Better Home and Gardens Magazine, TV's Extreme Makeover: Home Edition, Southern Living Magazine Home Builders, Nails Magazine, and many other blogs and websites. Discover quality, stylish, gorgeous hand-made wreaths at Elegant Holidays! 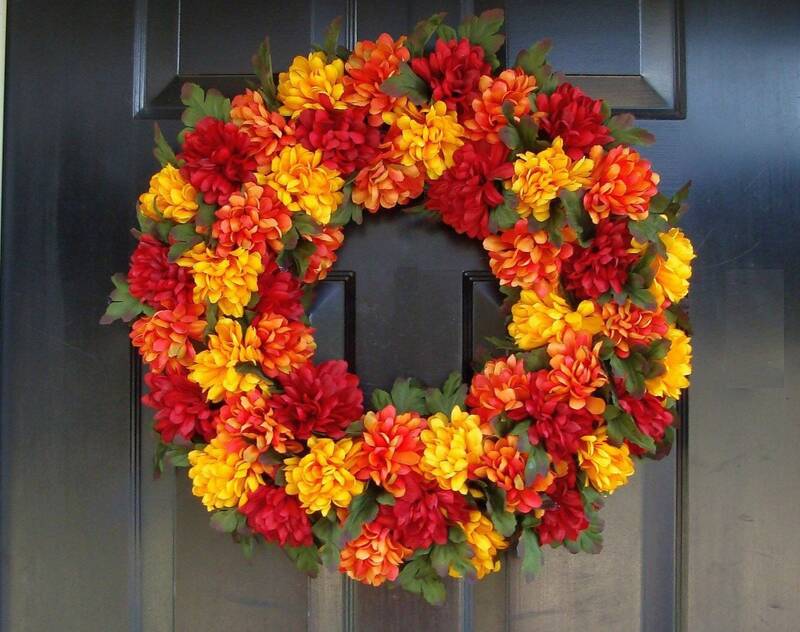 Red, orange, and yellow fall mums are gracefully arranged around a grapevine wreath. This large fall wreath measures 22 inches in diameter, 3-4 inches thick and is perfect for anywhere where you want to make a statement! This wreath may be able to fit in between storm doors so please convo me for final measurements. Check out my shop (elegantwreath) for many other beautiful, quality, handmade wreaths! Any wreath will make a great gift for a loved one or friend so you can always get two and save on shipping or have your gift shipped directly. Custom wreaths are always available so just convo me for options. Wreaths are always shipped via insured UPS service. I love my customers and always strive to provide a quality wreath for a great price! Perfect ... love the colors and the workmanship! Thank you for making me such a beautiful wreath! It arrived shortly after purchase, and I'm sure that we'll be enjoying it for a long time to come.